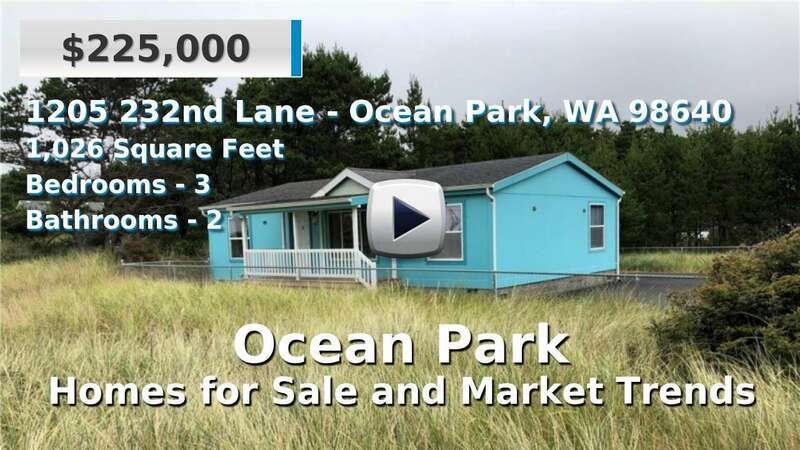 Ocean Park is a small community in Pacific County in the southwestern corner of Washington. It has a population of about 1,500 people and sits on Long Beach Peninsula in the Pacific Ocean, just north of Long Beach city and south of the Leadbetter Point State Park. Homes for sale in Ocean Park are about the average age for Washington and most have ocean views. The larger cities of Raymond and South Bend are about 55 miles to the northeast. Ocean Park is well known in the area for hosting the annual Northwest Garlic Festival and offering activities such as clamming, whale watching, historic walking tours, and more. 3 Beds | 1.75 Baths | 1247 sq. Ft.
3 Beds | 2 Baths | 2154 sq. Ft.
2 Beds | 2 Baths | 1512 sq. Ft.
2 Beds | 1 Baths | 1152 sq. Ft.
3 Beds | 3.5 Baths | 2827 sq. Ft.
2 Beds | 1.75 Baths | 704 sq. Ft.
2 Beds | 1 Baths | 6534 sq. Ft.
3 Beds | 2.25 Baths | 1772 sq. Ft.
2 Beds | 2 Baths | 1296 sq. Ft.
2 Beds | 1.75 Baths | 1172 sq. Ft.